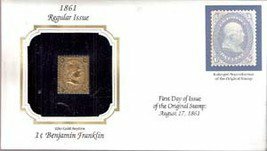 Postal Commemorative Society 22 kt Gold Replica Stamp and enlarged reproduction. The 22kt Gold is listed as an original issue. Mint Condition. We have over 40, if you are looking for a specific or want the entire collection, which will include the original blue binder. Message for details.